Even though outdoor pool weather in Minnesota is over for the year, now is the best time to talk about next season and water features you might want to add to your yard. When it comes to choosing the right pool, design and style are big factors to consider. Even if you’ve already got a pool or spa, perhaps you’re thinking of adding a little extra to the pool that you own. Imaging hosting some parties next summer to show off the new look throughout your pool area once you’ve added the fountain to the area! Regardless of whether it’s a new or existing pool, consider adding a fountain. Pool fountains are one of the new trends in outdoor water features that can add appeal to a pool or spa. There are a variety of types – recirculating, flowing, and even floating. You have many different fountains to choose from as well, which gives you a bit more to work with. The fountains that are found in swimming pools can vary, depending on the style and size that you want, which means that they might cost more or less. If you’re on a tighter budget then you might want to think about more affordable options. Always consider the best place to put the fountain as well. Working with a professional pool contractor during this period can help you determine the right fountain and location. 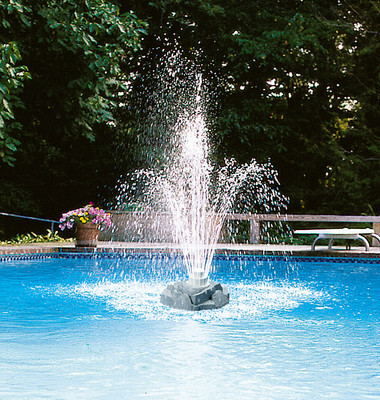 When you add a decorative fountain to your pool, you’re not only adding beauty but also more value. And don’t just pick something off the shelf – have a personalized landscape plan just for you. We specialize in designing outdoor areas which reflect both the homeowner’s taste as well as the style of the home and the overall landscape. And we can help you find the right fountain for your pool or spa. Even though it is winter time and your pool might be closed, it is important to think about the water feature you’d like to add to your pool. Don’t have a pool yet? Consider adding a new one to your landscape next spring. Speak with the professionals at Architectural Landscape Design to find out more of what they have to offer. We are a Minneapolis area pool and spa company.